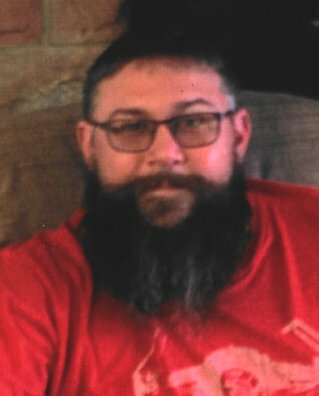 Kevin Silva, 39, of Walbridge, OH died unexpectedly on Friday, August 3, 2018 as a result of a motorcycle accident. He was born on October 6, 1978 in Fremont, OH to Albert “Moose” and Betty (Wampler) Silva. He was a 1998 graduate of Clyde High School. Kevin was currently working at Thyssen Krupp in North Wood, OH for the last ten years in various positions, including Fork Lift Driver. He was an Eagle Scout and enjoyed Legos, decorating for Halloween and loved living life. He also worked for the Haunted Hydro in Fremont. Kevin is survived by his parents, Albert “Moose” and Betty Silva, Green Springs, OH; sister, Melanie (Derek) Frey, Clyde, OH, brother, Jeremy (Julie) Gyurica, Fremont, OH; nieces and nephews, Alaura and Maylee Frey, Madison and Landon Hanover; his dog, Zuul; several aunts, uncles and cousins; former wife, Catherine Kopfman, Rossford, OH. He was preceded in death by his sister, Amanda Hanover; grandparents, Wise and Barbara Wampler, Emilie Silva, Inez Garza; his dog, Dio. Visitation: Friday from 2-4 pm and 6 – 8 pm at Horvath Hanes Funeral Home and Crematory, 211 N. Broadway St, Green Springs, OH. Service: Saturday, August 11, 2018, 11:00 am at the funeral home with Certified Funeral Celebrant, Susann Robitski Zimmerman, officiating. My friend, I had hoped to see you in the future with your son on the Eagle trail. Thank you for teaching me to never doubt what a Scout can learn and do. You proved to me you had everything I hoped you would learn. Kevin we loved your goofiness as well as your fun side. Give Emily a big hug for me and tell Cindy I miss her. Dear Mr. and Mrs. Silva and family. I am so sorry to hear of Kevin’s sudden and unexpected passing this past weekend. No words can take away the hurt you feel or the tragic loss you have to contend with but I want to say something. Kevin was one of our associates at ThyssenKrupp Materials/Copper and Brass Sales division. Kevin was a great employee and very well liked by everyone he worked or came in contact with (including me). I personally will miss Kevin’s polite good manners and helpfulness. He was a true company employee and friend to all. He went out of his way to help others learn their jobs and do good work too. I’m sorry for your loss and Kevin can never be replaced however let’s hope his time on earth inspired others to be as good as they can be. I am so sorry for your loss of Kevin. I will always remember him as the happy and kind person he was. Dammit Kevin, I was proud that you were a part of our family. You lived life to its fullest and made me happy. We are so sorry for the loss. Praying God brings comfort and rest. May the memories never fade. I just can’t believe he’s gone. Such an amazing human being taken from this world. So very sorry Betty, Moose, Melanie and Tammie. He was so loved and so full of love. I guess its Amandas turn to have him back. Prayers and hugs. Prayers to Moose n Betty,, so sorry for your loss. So sorry to hear of Kevin’s passing. My sympathy and prayers go out to his family. May God lift you up and help heal in this time of sorrow. Look onto wonderful memories and share with others as a way to celebrate Kevin’s life. Sympathy and prayers to the Silva family. Kevin will be truly missed by all the lives he had touched. He had such an amazing personality and has left lasting memories. Worked with lunchbox at olive garden… He was one of the nicest sweetest people i had ever met. We would hang out and watch lightening from my roof…. He played with my kids…. He was just so much fun to be around. Never a dull moment. He was just awesome and will be forever loved and missed. My thoughts & prayers for the Silva Family….heartbreaking news. Kevin was one of kind. A genuine good guy who left a positive impact on everyone he met. He will be greatly missed. Gone too soon. Dear Betty…my heart breaks for your family. Such a tragic loss. Prayers for healing and peace. God bless. Sorry to hear of the loss of your son. There are only a handful of people we meet in life that are liked almost every person they come into contact. Kevin was one of those people for me, and I’m thankful that nearly every memory I have of him involves laughter, often uncontrollable fits of it. I want to let you know that I am thinking about you. My thoughts and prayers are with you. May God give you peace and comfort during this difficult time and may He heal your hearts. I am so sorry I did not make it to the visitation but you both have been weighing heavy on my heart this week. My heart breaks for you and I want you to know that Kevin and you are in my thoughts and prayers. Kevin was my brother’s nephew whom I got to know through family parties and other events. He was funny and kind and will greatly be missed. May God give you strength and comfort during this difficult time.